Renata Lucas’s works examine how the built environment informs social relations and actions. 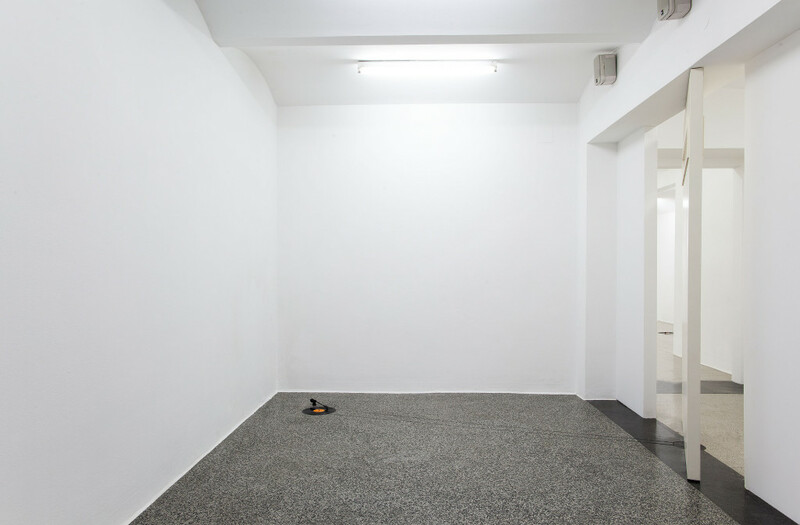 The artist considers structural elements as language of a space, thus in site-specific interventions, she manipulates architectural structures to deconstruct socially defined spaces and their uses and test novel and playful possibilities. By way of addition, duplication, or superimposition, she designs subtle modifications that suggest alternative perceptions of a place. In our gallery, Renata Lucas realizes her intervention Ø (Secession 2014). 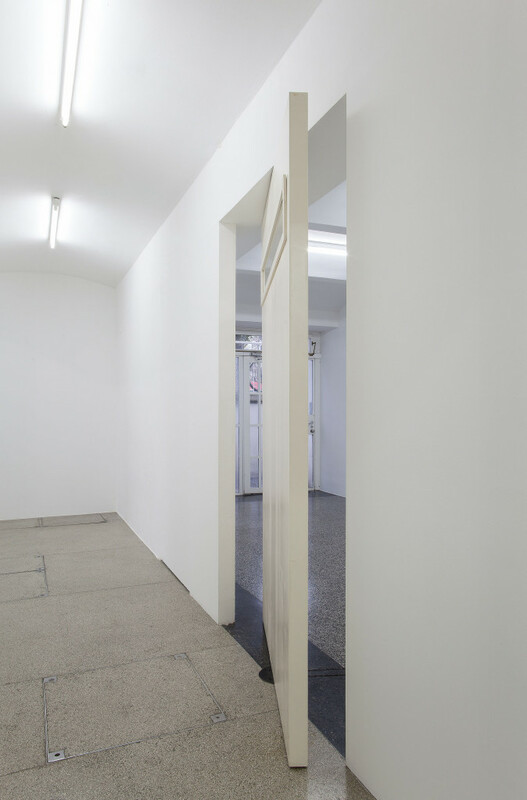 Two revolving doors that rotate in both directions and visually blend in with the building’s general style guide the visitors in an almost dancelike movement from the gallery’s entrance to the emergency exit on the other side. 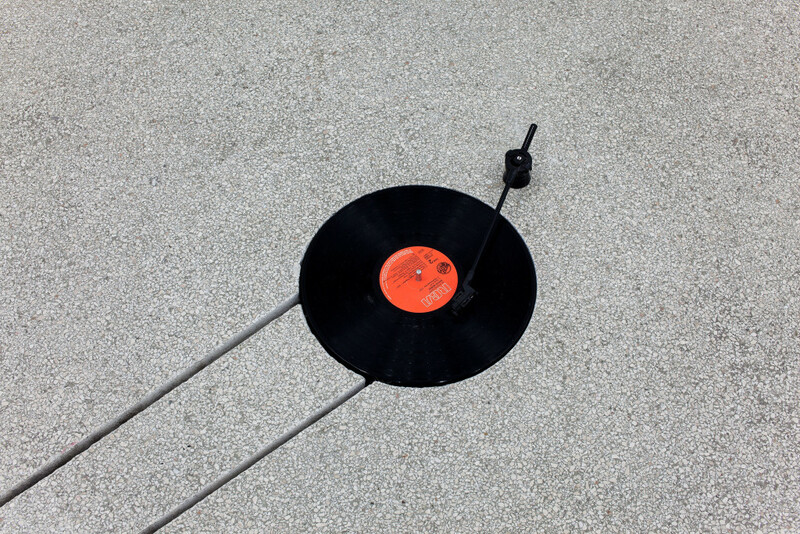 At the same time, the revolution of the doors actuates a mechanism that operates two record players embedded in the floor. 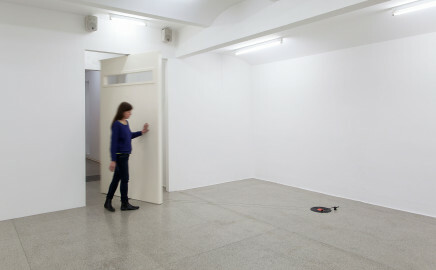 The moment one of the doors turns to allow someone to pass in or out of the room, the associated turntable is set in motion and a sound is heard: visitor movement and the acoustic environ-ment are immediately correlated, although the melody, a sample from a pop song, is distorted—the pitch is too high or too low, and sometimes the music even plays backwards, depending on the speed and direction in which someone pushes the door. In an allusion to her intervention and the visitors’ movements, Renata Lucas has selected short snippets from the song’s lyrics: “she’ll come,” “she’ll go.” The music is trapped in an endless loop: the needle keeps skipping back, its path blocked by a piece of tape. The conceptual point of departure for the artist’s interventions at the Secession is the Argentinean writer Adolfo Bioy Casares’s story Plan de evasión [A Plan For Escape, 1945]. In the form of diary entries, an inmate describes the obscure experiments of the governor of a prison island off the coast of French Guyana: he surgically alters the prisoners’ sense perception to allow them to experience freedom—though only inside their minds—despite their hopeless situation. Inspired by the literary source and in light of the countless restrictions that limit what the artist can do in a heritage-protected building, Renata Lucas addresses the hermetic setting of her show in the Secession’s basement with an attempt to highlight the interface between interior and exterior spaces. 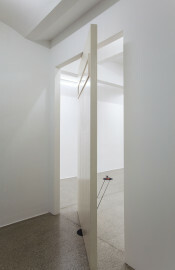 In a piece by Lucas also entitled Plan de evasión (Secession 2014), Casares’s story takes a quite unusual route and in doing so reaches unsuspecting readers, hence a new audience: the artist has divided it into six sections she has planted inside books for sale in the Secession’s shop. A bookbinder was hired to remove pages from selected books and replace them with fragments of Casares’s text in the Spanish original. Almost imperceptible, the new pages lurk in the books as parasites of sorts. In her interventions in the Secession, Lucas has mixed literature fragments, musical phrases and architectural elements to map literal as well as symbolic escape routes, and in both senses the visitors to the exhibition are revealed to be the protagonists who complete her work. Renata Lucas, born in Ribeirão Preto (Brazil) in 1971, lives and works in Rio de Janeiro.